These brandy drink recipes are just ideas and if you like, please feel free to use whiskey or bourbon. 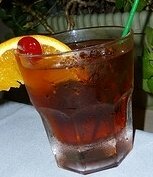 I have brandy old fashioned, brandy alexander, brandy slush and many more cocktail drink recipes below. Place in a blender and mix until smooth. Place a sugar cube in the bottom of the tub and crush. Add the bitters and 3 ounces of 7up or Squirt. Mix well and fill with ice. Top off with brandy (or whiskey). Stir with straw and garnish with orange slice and a cherry. You don't have to use a sugar cube; a teaspoon of sugar will do. I just like this "old fashioned" part of making this drink, and this was how I was taught how to make them. I also love to make them "sour" with Squirt and have olives in them instead of fruit. Muddle a hearty slice of orange and a cherry with 4 dashes of Angostura Bitters. Add ice, 2 ounces of brandy and top off with 7Up. Stir gently and garnish with another orange slice and cherry. Add the sugar if it is not sweet enough for you. 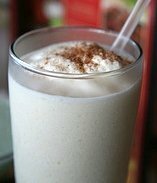 Following is a mixed drink recipe for homemade brandy slush. We always take this parties. Try it, you'll LOVE it. Bring all of the above ingredients to a boil and let boil for five minutes. Cool slightly. When ready to freeze, Mom always used a empty ice cream bucket and poured it in there to freeze - worked like a charm. When ready to serve, put desired amount of the frozen mixture into and glass and top off with the 7-Up or Squirt. Muddle forcefully: 2 lime wedges, a sugar cube, a dash of cherry bitters and a dash of soda water. Add 2 ounces of brandy and stir to dissolve sugar. Add ice and garnish with a cherry. Recipe adapted from Nathan Greenawalt, owner of Old Sugar Distillery in Madison, Wisconsin. I have more than brandy drink recipes, please check out more drink recipes below.